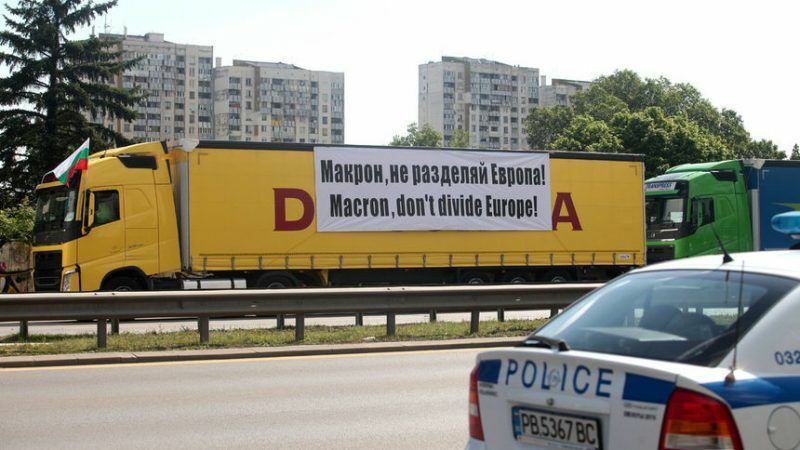 Trucks from Bulgaria and other low-wage eastern European countries are a common sight on the roads of western Europe, competing with local firms whose drivers are paid much more. Prime Minister Boyko Borissov, who hosted the EU summit, said the proposed changes would “kill the Bulgarian sector”. French President Emmanuel Macron said he hoped a compromise could be found in the coming months. “We will find a balanced deal together that will ensure the proper working of the single market, good social protection and fair competition in the transport sector. September has to be our objective,” he told a news conference at the Sofia summit. Drivers from Bulgaria, where average monthly wages of little more than €500 are among the lowest in the EU, often spend weeks moving loads between countries including Germany, France and Britain, before returning to their home base. Bulgarian transport firms said this would erase eastern European companies’ competitive advantage. In what looked like a PR stunt, Andrey Novakov, an MEP from Boyko Borissov’s ruling party GERB, announced on Facebook he would ride a TIR truck to protest against the proposed law. A controversy unfolded following a statement by the head of the European Parliament’s EPP Group, Manfred Weber, who said in Sofia on 16 May that with its 219 MEPs, the EPP group will support the GERB proposals for the mobility package. However, the EPP, just like other political groups, are divided on the mobility package as most MEPs have national positions to defend on this issue. “We are the free market party, we want this market to have competitiveness. European mechanisms must not be used, measures must be put in place that in one way or another punish the Bulgarian carriers and give priority to the French”, said Weber. “We want to have competition, protect companies and their jobs. What strongly surprises me is the position of the Socialists. At the European level, it is precisely the Social Democrats and the Socialists who are the most pleading for the introduction of higher social standards. It is not normal that Bulgarian socialists advocate for higher social standards in the European Parliament, and in Bulgaria, they oppose them”, Weber said. That drew a furious reaction from S&D MEP Peter Kouroumbashev, who described Weber’s statement as an “absolute lie”. “I would like to recommend to the EPP Group Chairman in the European Parliament to get acquainted with the position of MEPs from his own parliamentary group regarding the European Commission’s proposals. During the discussion [on Tuesday] of the legislative proposals in the EP Transport and Tourism Committee, Mr Vim van de Camp, a member of the European Parliament of the European People’s Party and a rapporteur on the regulation in question, unambiguously supported the position of France and Germany”, Kouroumbashev stated.